This is product is worth for those who are looking for a medium range phone. It has got almost features. Phone lags during heavy tasks. Sometimes phone automatically get clicking on the top of the phone . Lenovo K50a40. I purchased it online from Flipkart at 10K. It has 4gb of RAM with an internal memory of 16gb.It has an android version of 5.0.2(Lollipop) and can be upgraded to 6.0.1(Marshmallow) which is now available in new versions of Lenovo.It is adual sim android phone also provided with a slot of inserting memory card upto 32gb.It has a battery of 2700mAH.It has a 1.7 GHz octa core processor. It has a front camera of 5 mega pixels and a back camera of 13 mega pixels with flash.It supports multi purpose facilities like listening to music and texting at the same time. I have very amazing experience with this phone but now at this price you can get new models with 3gb of ram and a front camera of 5 mega pixels with flash with an improved battery back up. 1. 2gb of ram and you can play most of high graphics games almost in hd quality. 3. 1 year of warranty. 4. Android version of 5.0.2(Lollipop) which can be extended to 6.0.1(Marshmallow). 5. Supported with dolby Atmos and has a better sound quality. 1. It has a poor battery backup and hangs very frequently even with 2gb of ram. 2. It gets heated up very quickly. 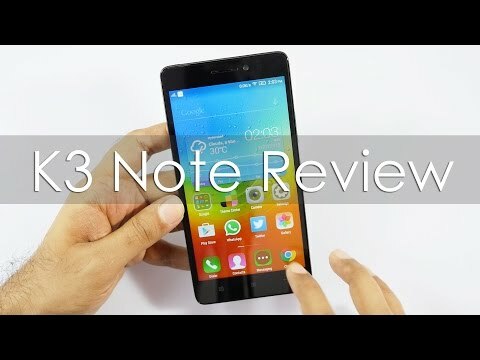 24 Pricebaba users have written their experience with Lenovo K3 Note. If you own Lenovo K3 Note, please do leave your feedback too. Lowest price of Lenovo K3 Note price in India starts at Rs. 6,999 Lenovo K3 Note is available on Flipkart at Rs. 6,999 and on Amazon at Rs. 6,999. Prices updated on 21st April 2019. Lenovo K3 Note is a budget Android smartphone with the keyword Note it has a huge 5.5 display. It is multimedia rich with mix of features like Dolby Atmos and big bright display.It comes in White, Black & a bright Yellow colour. It competes with the likes of Redmi Note and the Moto G 2nd Gen. It has a 5.5 inches IPS display with a resolution of 1920x1080 pixels with a pixel density of 401 PPI. The display is based on One Glass Solution technology which eliminates the gap between the display glass and the touch-screen matrix. This also caters to better viewing angles which is recommended on huge phones like these. Running on a powerful 1.7GHz Octa-Core processor which is 64 bit, it will run Android 5.0 Lollipop with ease. Lenovo Vibe UI 2.0 skin is loaded on top to provide all the animations and transitions. To handle all the extensive multitasking it has 2GB of RAM. Multimedia is the one place where it shines, it has Dolby Atmos audio for enhancing the listening experience and internal storage of 16GB which can be expanded with the help of an microSD expansion slot to upto 32GB. Even if thats not enough, there is also a support for OTG upto 32GB. The camera on the Lenovo K3 Note is an Omnivision OV13850 - 13 megapixel unit with an aperture of f/2. The camera gets an LED flash and i capable of recording video in FullHD resolution. The front camera is an average 5 megapixel shooter. Phone comes with dual-SIM 4G slots and has a battery capacity of 2900mAh. It is available in three colors - Onyx Black, Pearl White and Laser Yellow.